I had the chance to test out a newer feature from Floathub that tracks your trips and creates a nice summary. The screen shot above shows our entire trip on a map, but the feature allows for a lot more data visualization and information. I hope to write a bit more about it soon, but the map is very useful to help remind you of your journey. 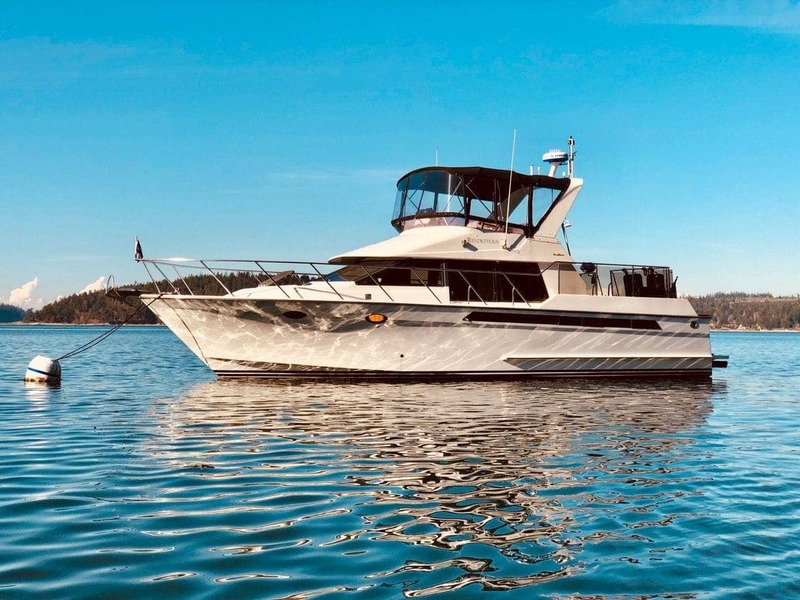 The plan was to meet up with Sea Bear, an Angel 62' that I spent last year flotilla-ing with on my Princess Louisa Inlet trip, near the Shilshole entrance buoys. They were coming out of Lake Union and through the locks for the trip up north to Friday Harbor, where the boat is kept for most of the summer. We expected them to take a while to get from South Lake Union all the way through the locks, and got a leisurely start to our day, getting over to the fuel dock around 10AM. 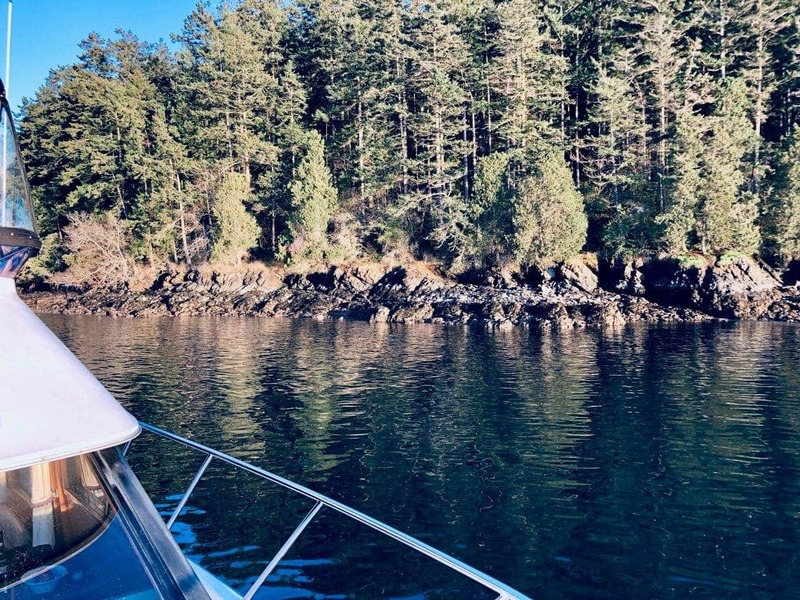 I got a message that Sea Bear was already through the locks, dropping extra crew off at Shilshole, and about to head north, so we finished fueling, and got out of the marina quick-like. 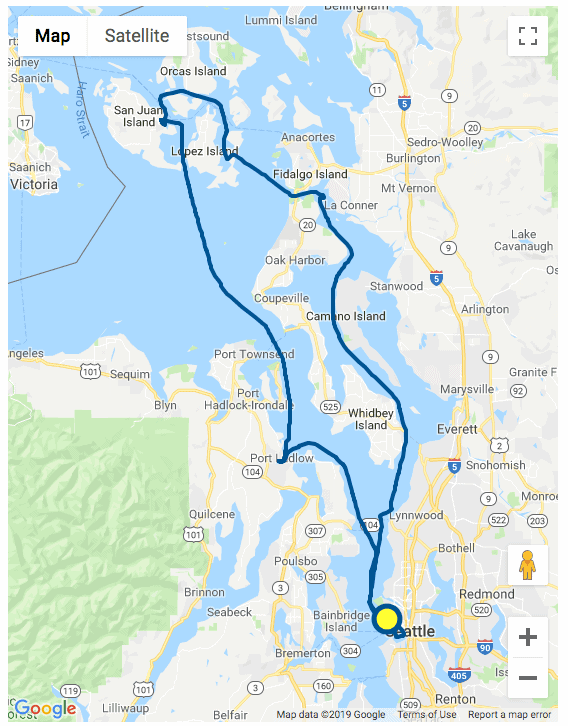 We sped up to 15 knots (not the most economical fuel-wise) and made it from Elliott Bay Marina to just north of Shilshole in about 25 minutes. 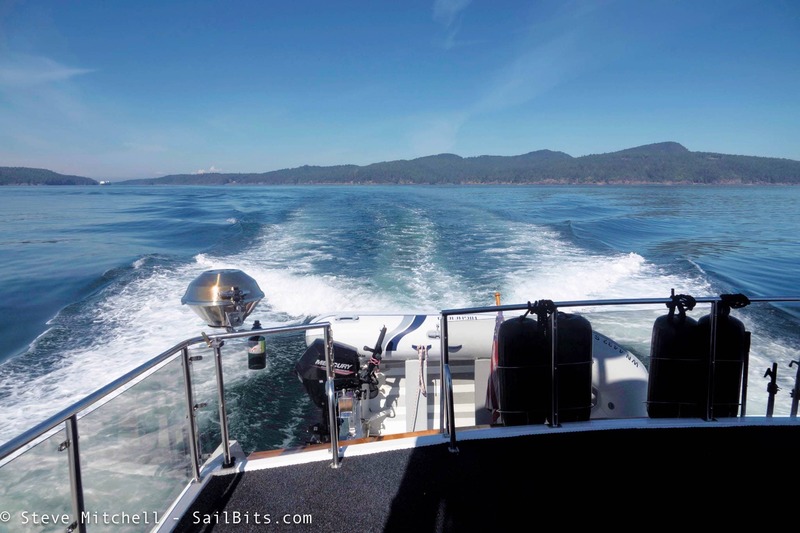 Slowing up to 11 knots, we eventually caught up to Sea Bear on our way to Port Ludlow. I still use the Yacht Devices Voyage Recorder all the time, and especially on trips. This time around, I was interested in tracking fuel usage data and running the boat at various RPMs to see what changed. I wrote down a bunch of things, and took pictures of gauges at various times, when all I really needed to do was export all of the data when I got home. The spreadsheet above shows the first day of our trip, when I was going various random speeds, and the averages and maximums for a number of parameters I was interested in. Looks like I averaged 1500 RPM, with a max of 2200 RPM, and an average SOG of almost 11 knots. This was my first time to use the updated flybridge electronics setup on a longer trip. 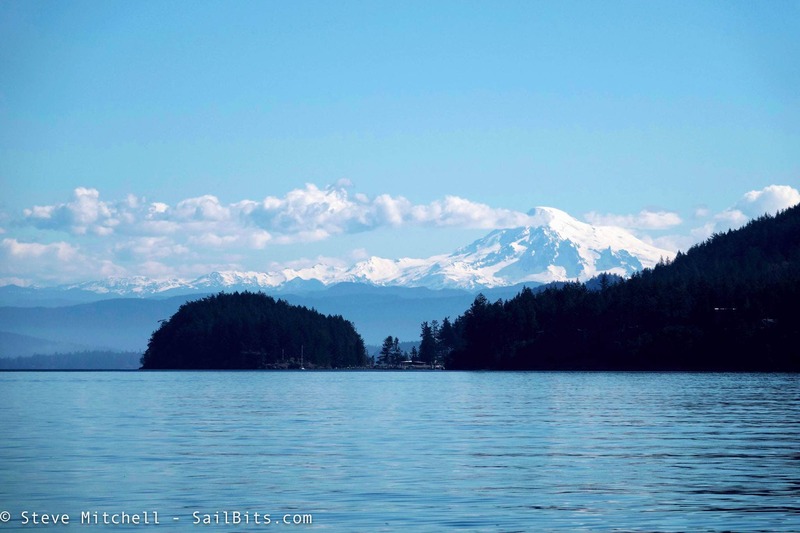 We arrived at Port Ludlow around 1PM, anchored in a wide open field, and proceeded to explore in our dinghies. 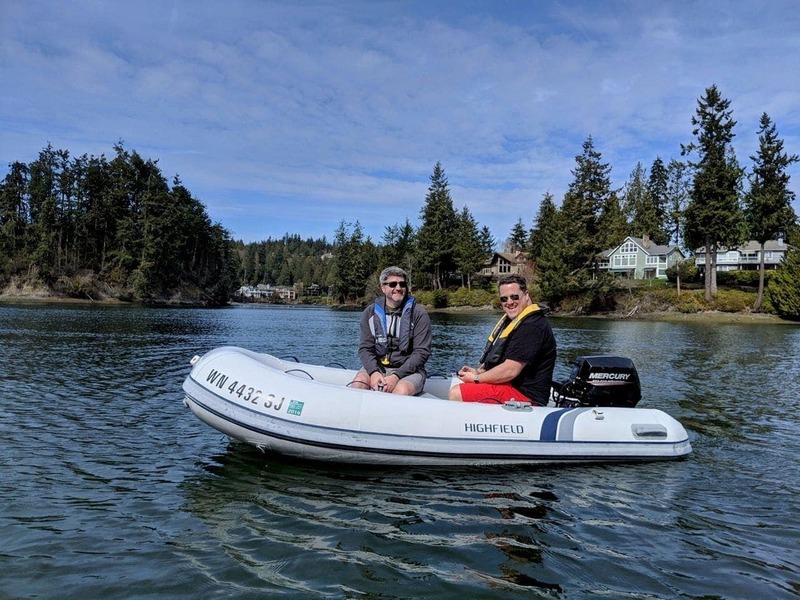 We explored around the bay and even deeper inward around some small islands, saw some seals playing, and enjoyed the 65 degree temperatures, in March! We invited Holly, Sea Bear's captain, and her crew Steve Roberts over for dinner. 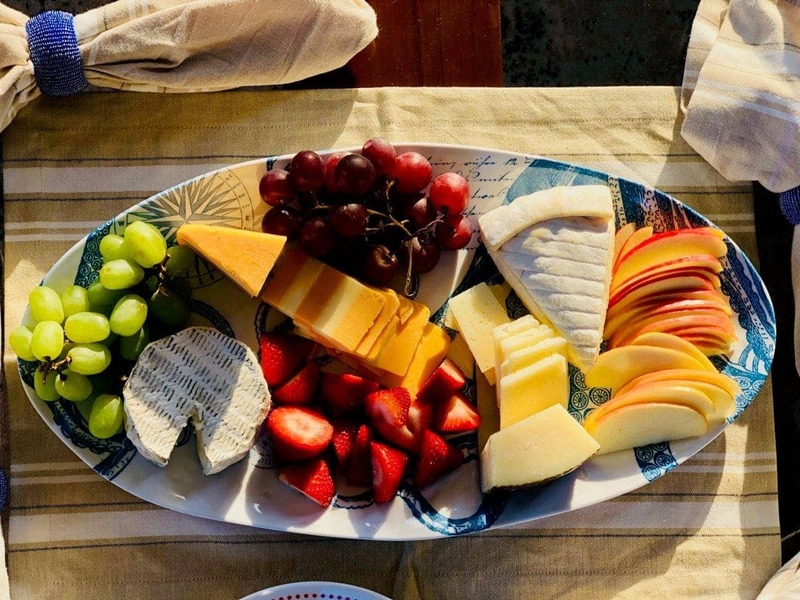 It was the first real fancy dinner we had ever prepared on Rendezvous, and it was perfect! Plenty of sun, food, and good conversation. Jake was my crew for this trip, and he gave me a wonderful bar set for a boat warming present a few months ago. 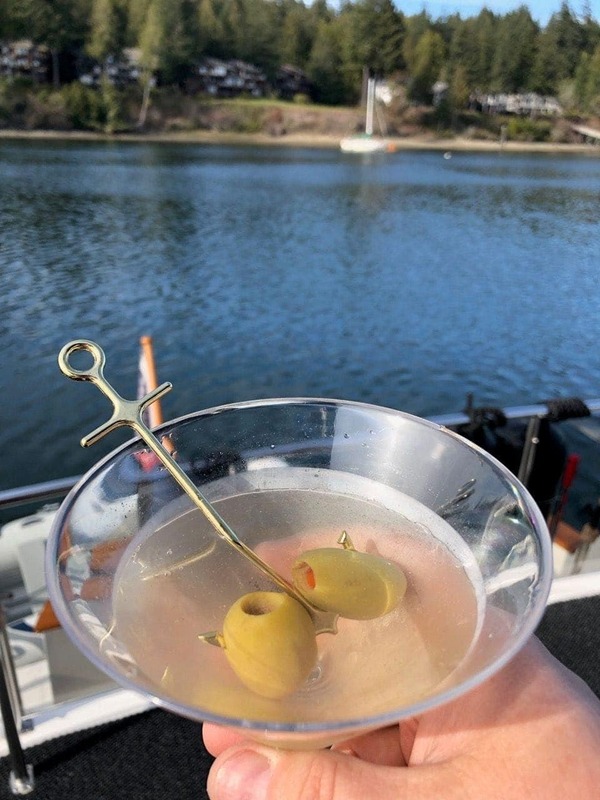 With it was some very creative olive holders for martinis - everyone loved them! 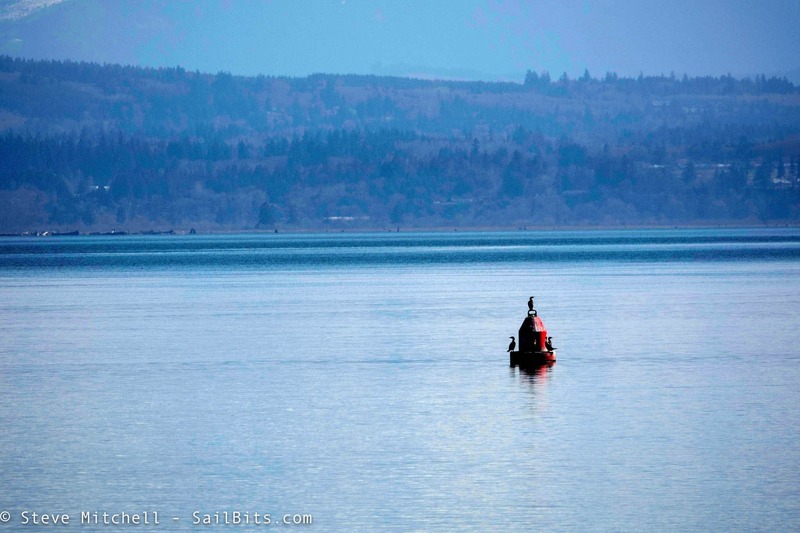 We got started early on Saturday morning, around 7AM, and headed north from Port Ludlow. It was another beautiful day, if a little cold. I couldn't drive from the flybridge because of the amount of mist on the windows, and I was OK with that, since it was much warmer below. After having been told by many others that I would not drive from this location, I am glad I invested some time and thought into making it usable. If we're bow-up going faster than 12 knots, it does become very hard to see anything useful, but at anything less, it is completely usable. I'm also enjoying my 5th wedding anniversary present from my husband - a wonderful blue bar chair that fits perfectly and is the right height for driving. Near Fort Flagler and Marrowstone Point, the flybridge warmed up enough to get rid of the mist, and we moved upstairs. One thing I noticed throughout the entire trip is that the black canvas covered flybridge gets much warmer than I would have expected. For this time of the year, that's OK, but in the summer, we're going to have to be creative with opening panels to let breezes through, or maybe even something more intensive. Another reason that driving from the salon was nice - out of the shade, and cross-breezes. Around this time, we came upon the Pt. Townsend to Keystone ferry crossing, and I noticed something that I asked Furuno support about, and had been watching for a while. You can see the WSF Kennewick AIS icon (top blue triangle) and the DRS4D-NXT radar ARPA target right below it. Everything is showing up this way, with the ARPA target offset a similar distance no matter what the vessel orientation is. Since this vessel is broadcasting on AIS class A (frequent updates) and moving fast (which means even more frequent updates) and there were very little other vessels, I assume that there is something not setup right with the radar. AIS can be off a bit, but for the ARPA target and AIS to be off this same amount for everyone is odd. The Furuno NavPilot 300 worked flawlessly this entire trip, and was using a course I first planned on my Surface Book using TimeZero Professional, and then synched to the TZT2 MFDs in the flybridge. I made some on-the-fly changes for a few waypoints, but overall, I let the NavPilot drive most of the time. The real improvement was the Furuno FI-70 display, seen on the right above. Combined with the Actisense EMU-1 engine monitor, this single display shows me everything I need to know about both engines in one compact location. 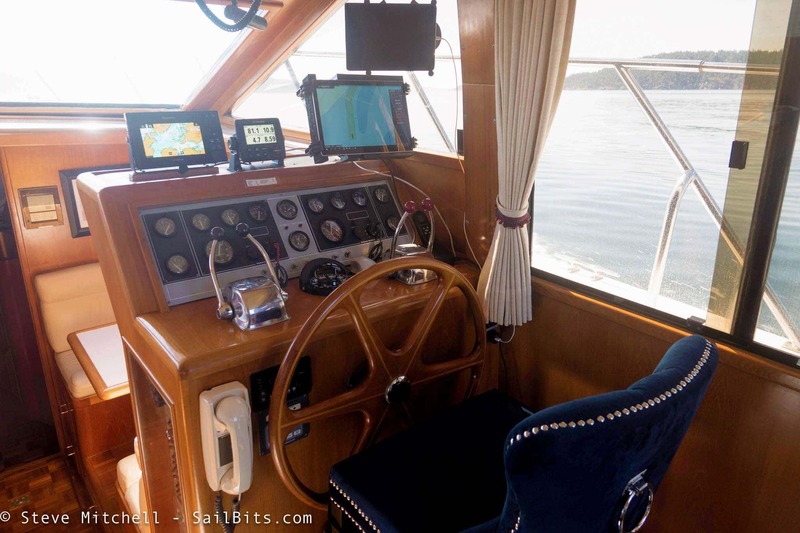 The throttles and gear levels obscure the existing analog gauges at this location, and I found out on this trip, several of them are off by quite a bit, especially the starboard engine tachometer. Now I have the engines running closer to eachother RPM-wise and things sound better and feel better. 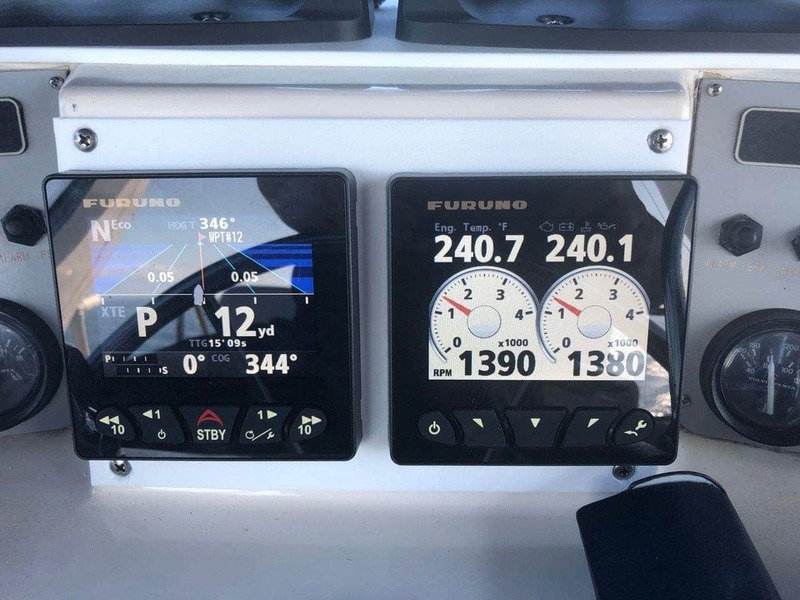 I will likely pull out the analog gauges after this season, and hide them inside the flybridge, as I know that disconnecting them outright could cause problems with the senders. That could leave a decent amount of real estate for new displays and instruments. 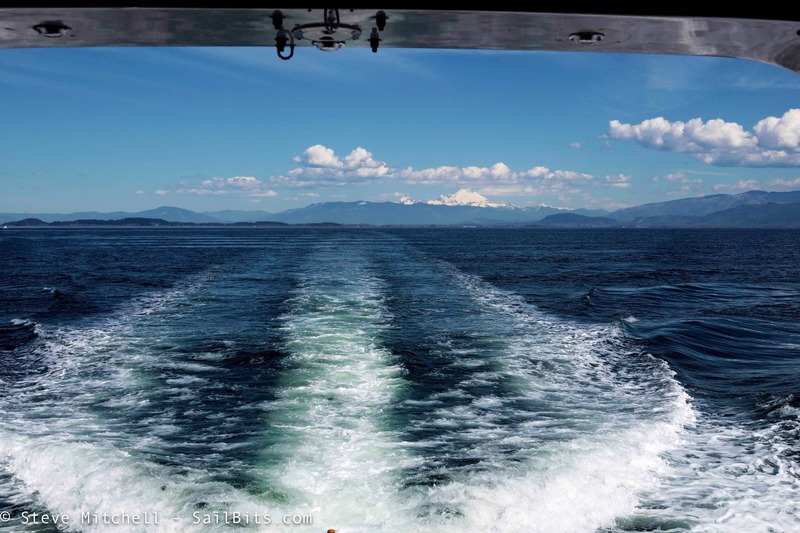 Soon we were crossing the Strait of Juan de Fuca in perfect conditions - hardly any waves or wind, and beautiful sunny skies. Sea Bear had an engine throttle cable disconnect about mid-way across, and we slowed down for a bit, but it was easily fixed. 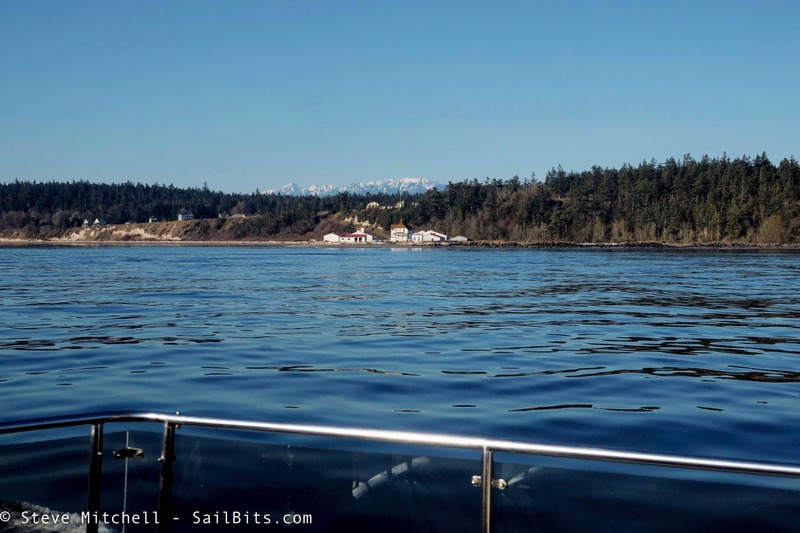 Soon we were in the islands nearing Friday Harbor. After running for 5 hours at about 9 knots, I kicked our speed up to about 13 knots and was rewarded with a nice cloud of dark smoke - the engines definitely prefer running a bit higher, enough for the turbos to actually register some boost. From what I've learned about these engines, running them at 9 knots is OK as long as you run it for a few minutes at the end of the day a bit faster. 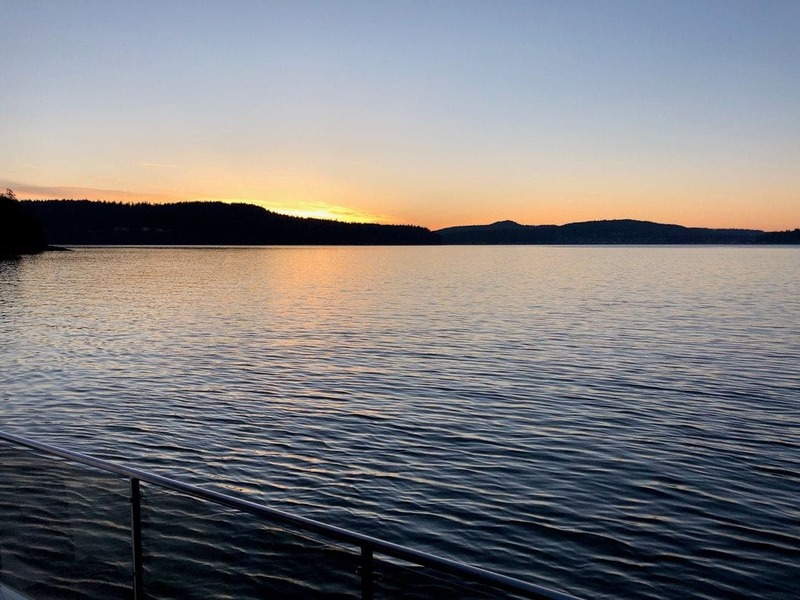 We had originally planned on grabbing a space on the Port of Friday Harbor breakwater, but both primary anchorages were virtually empty. Jake and I explored around closer to the ferry terminal and didn't really find a spot we liked, so I scooted over near the University of Washington Labs area, and we anchored in about 20 feet of water. Only two other boats were nearby and both looked like they had been there for a while. It was a beautiful spot with wonderful views, a waterfall in the interior of the cove that we could hear happily bubbling away, and very little waves. 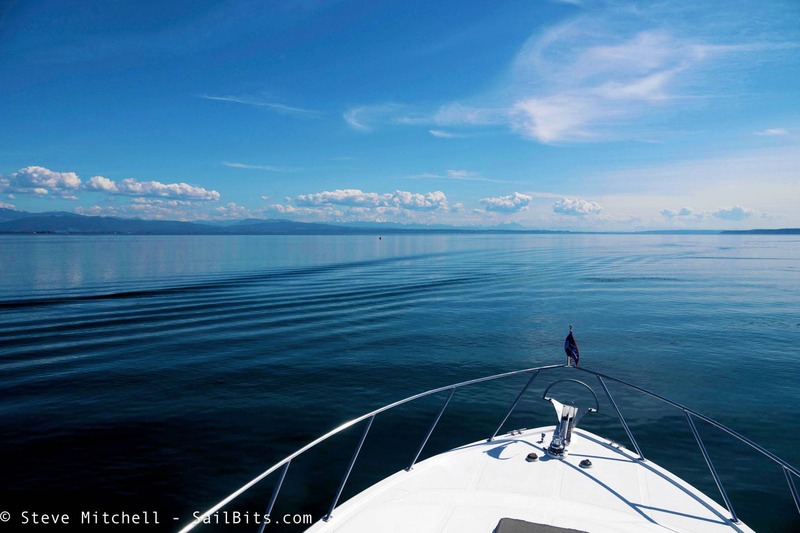 We had a nice dinner of Steve's famous fish tacos aboard Sea Bear that evening, and prepared to depart the next day. 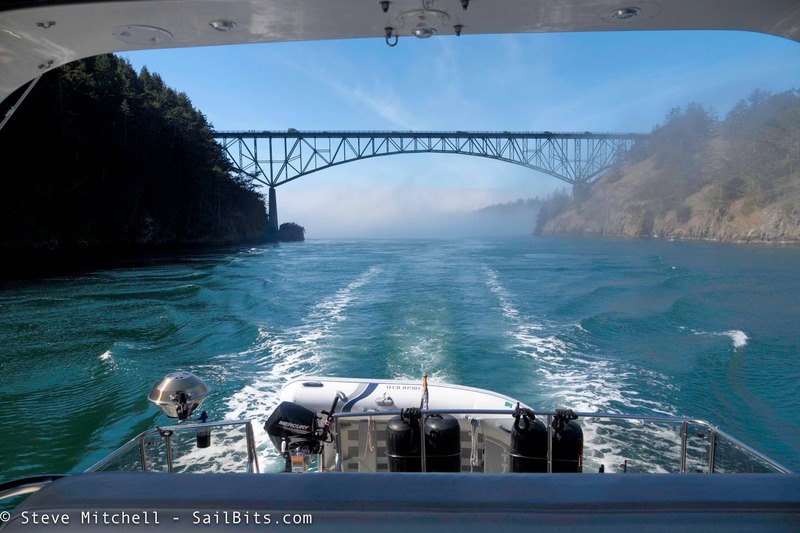 We departed Friday Harbor around 10:30AM, waiting for the fog to dissipate, which is common this time of year in the San Juans, and the right time to get to Deception Pass. 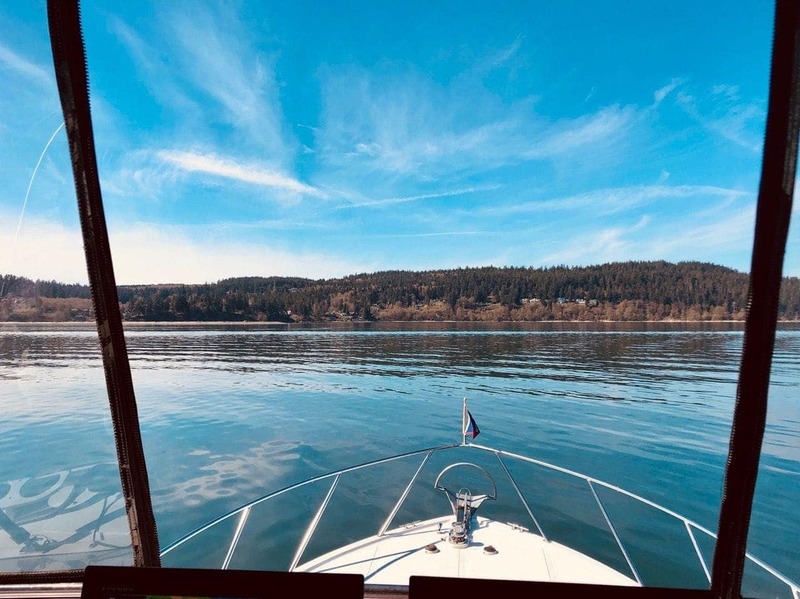 Our course today was up through the Wasp Islands, between Shaw and Orcas Islands, and down through Lopez Sound, which I had never been through. We were trying a few different RPMs and speeds to see how things worked out fuel-wise. Beautiful views everywhere, and when we made the hairpin turn into Lopez Pass, the mountains were out in great style. As I guessed, there was a band of fog out in the middle of Rosario. With the new radar and other electronics, I wasn't too concerned, although we did get pretty close to another recreational boater heading north, and ended up doing some large course changes to signal intentions. Both of us had each other on AIS. 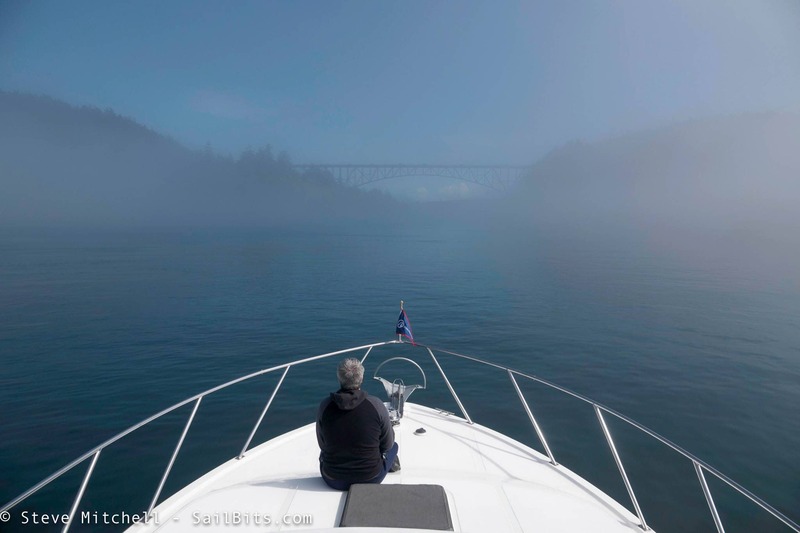 After waiting in thick fog near Deception Pass, we started creeping forward about 20 minutes prior to slack water. Soon, the bridge appeared out of the fog - Jake was on the bow listening for anything in the water, and also enjoying the view. 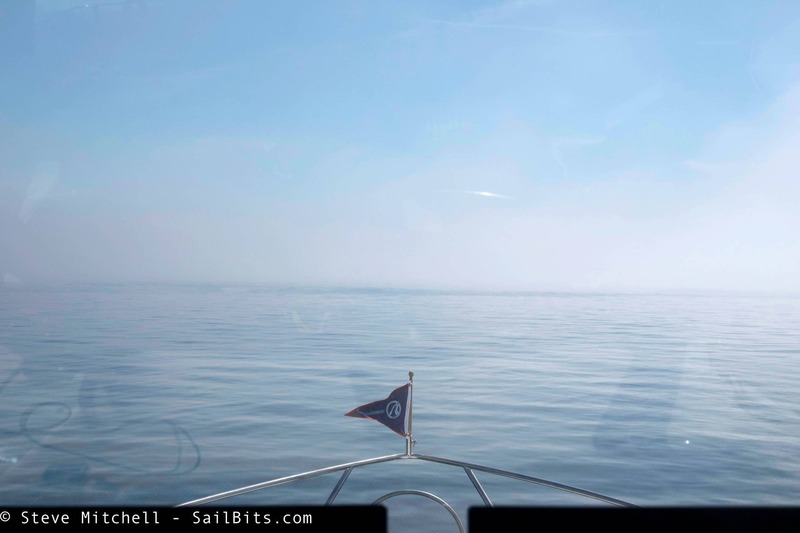 The rest of the pass was uneventful - a couple of other boats passed heading out into Rosario and the thick fog that still remained. We did get a few people who were on the bridge waving at us as we emerged from the fog and went under the bridge. The fog coming through the pass and under the bridge was pretty mesmerizing. The video shows it a bit, although cameras never do fog justice. 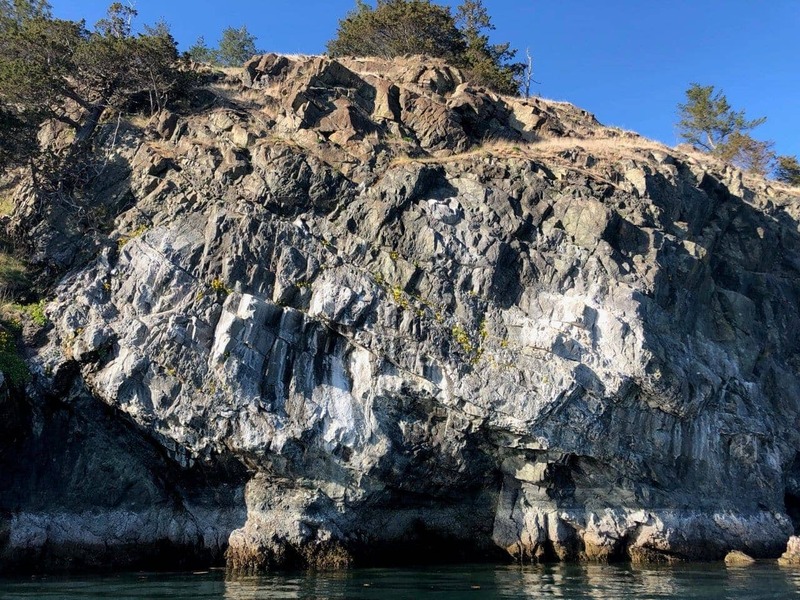 My plan was to anchor near Hope Island, which is only a couple miles in from Deception Pass, but we noticed several mooring balls available, and decided to try our hand at grabbing one, which we have not done on this boat before. I also had thought that many of the Washington State Park mooring balls were too small for our boat. It turns out these particular ones were ok for boats up to 45', and since we were in very calm conditions, I wasn't worried that we were close to that limit. I don't think I will use them in current-prone areas like Blake Island, or in more active weather, though. Jake grabbed the buoy on the first try, and I came down to help thread the line up to the bow. This particular mooring was quite close to shore, and afforded a great view of the island. We saw all sorts of birds come and go from the shoreline, trees, and elsewhere. It was still pretty warm for March (60F) and we enjoyed some time on the deck in the sun, and generally just relaxing. After a while, we decided to dinghy in to shore and pay for the mooring, as well as explore a bit. The beaches were fantastic, with a bit of sand and small shells instead of the usual Puget Sound boulders. It didn't look like many people were paying for moorage, since the pay station was pretty trashed. I hadn't purchased a Washington State Marine Park pass this year, as I expected to anchor most of the time, but we still left payment, as we like to support these fantastic resources. We walked around a bit, looked for the trail to the other side of the island, but didn't really find it. Instead, we dinghied around the island to the south side, and explored the wonderful rocks and beaches for a while. I was still fighting a cold that I had for over 2 weeks, and finally decided that whiskey may help. Jake had brought, of all things, Fanta, which I hadn't had in years. 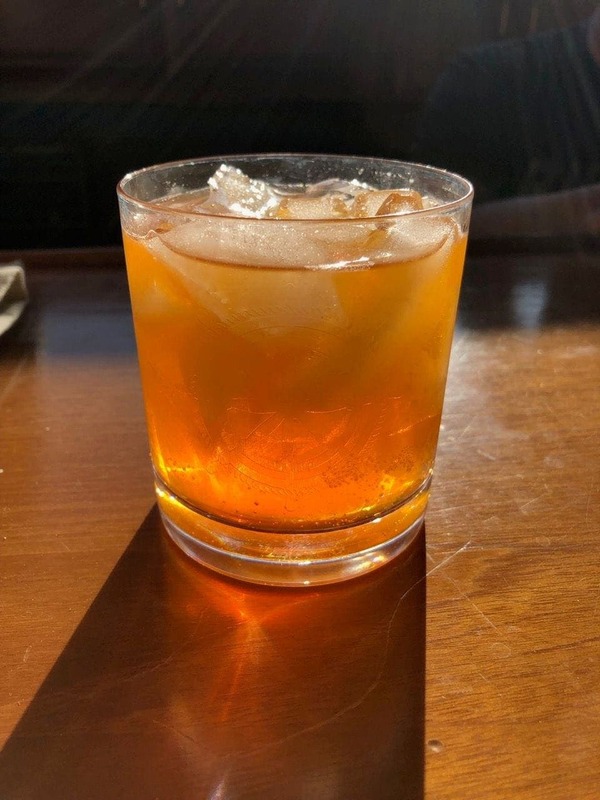 He made a Jameson Caskmakes + Fanta + soda water concoction, and I gladly tested it out for him. I still had the cold the next morning, and perhaps a bit of a hangover, but I sure enjoyed the evening! The sunset was spectacular, just like the last 3 nights. We were very, very lucky to have this many days in March with such settled and warm weather. 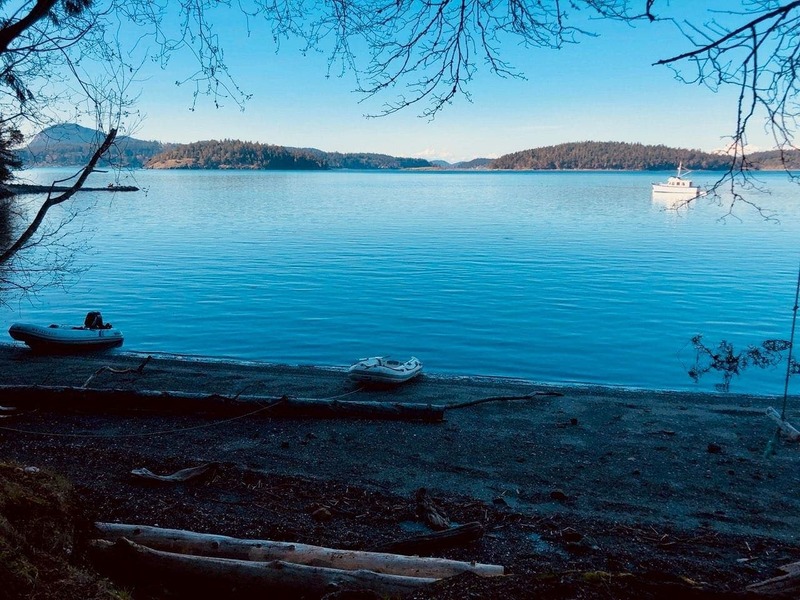 We left Hope Island around noon, expecting about a 5 hour run from here to Seattle. 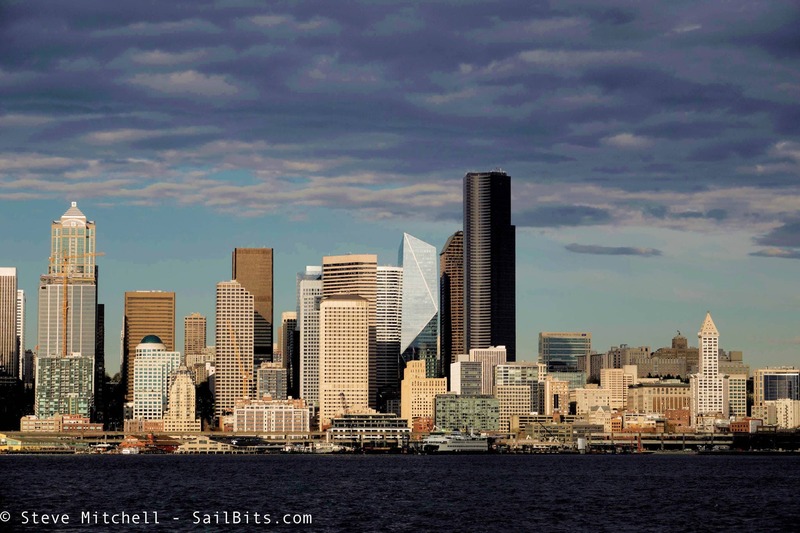 The wind was due to pick up from 2-4PM in Elliott Bay, as usual in the summer, even though we were still in March, and I wanted to arrive close to sunset so I could avoid dealing with gusty winds in the marina. 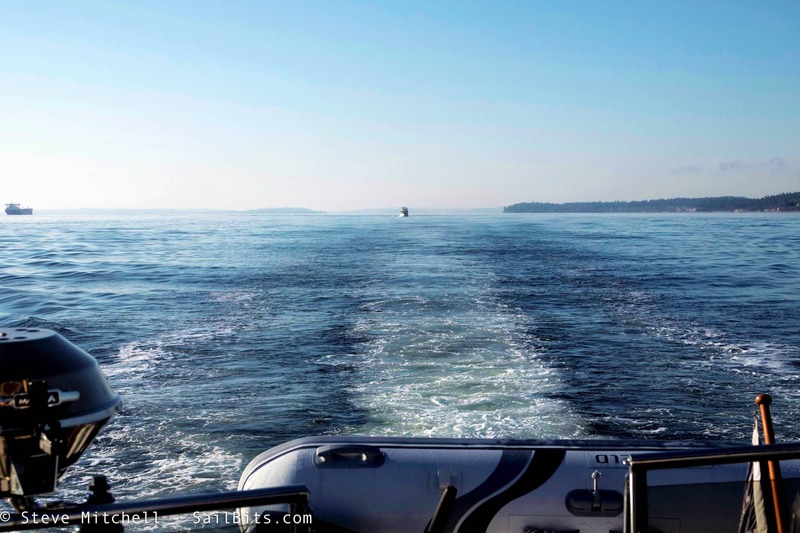 The water was even flatter here than it had been in the last 3 days, and we enjoyed some porpoises jumping our wake, and cormorants fighting for a good spot on the various buoys as we transited down Saratoga Passage. Right before Oak Harbor, Jake spied a whale about 1/2 mile away, and we slowed and watched it surface a couple of times, and then disappear. I saw the day after that a grey whale was sighted there and assumed that is what we saw. 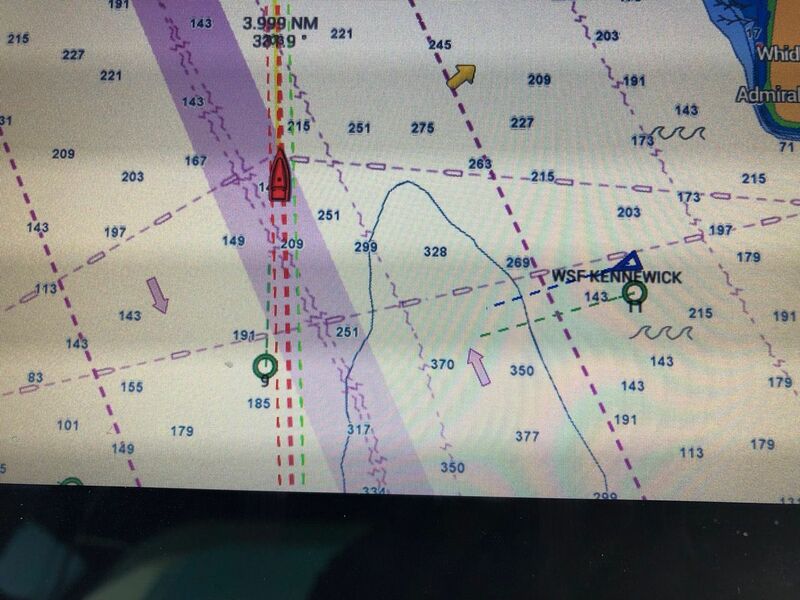 We passed a couple of boats heading south, and only one heading north. It was originally forecast to rain, but we clearly were getting the best weather on this trip. On the way back, I set up a number of tests to figure out fuel burn. 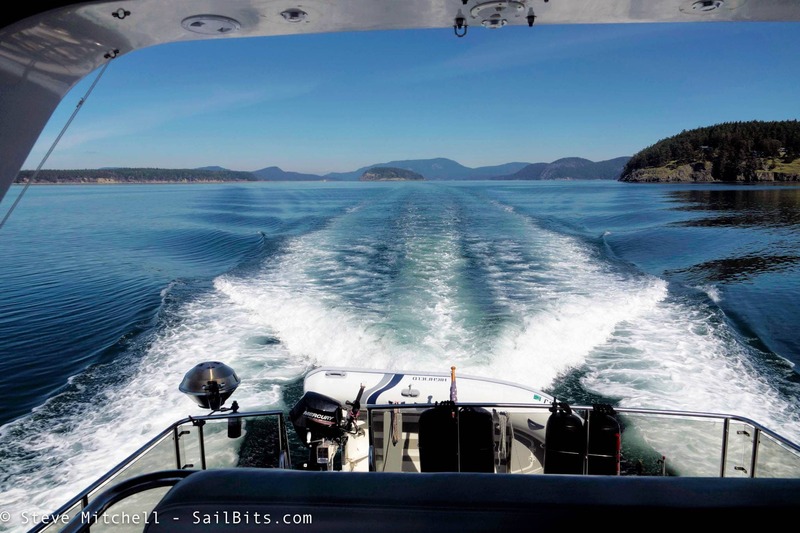 I used the ultrasonic diesel tank monitor I had installed a while ago, brought the boat to as close to a stop as possible with no waves, took a reading, and then proceeded to drive at a particular RPM for an hour, varying the speeds with each test. I also used the data from the Yacht Devices Voyage Recorder I mentioned earlier in the article. I can't say I have definitive data about fuel burn - some of the runs I did twice over the trip, in similar flat water with as little current as possible, and got wildly varying amounts. 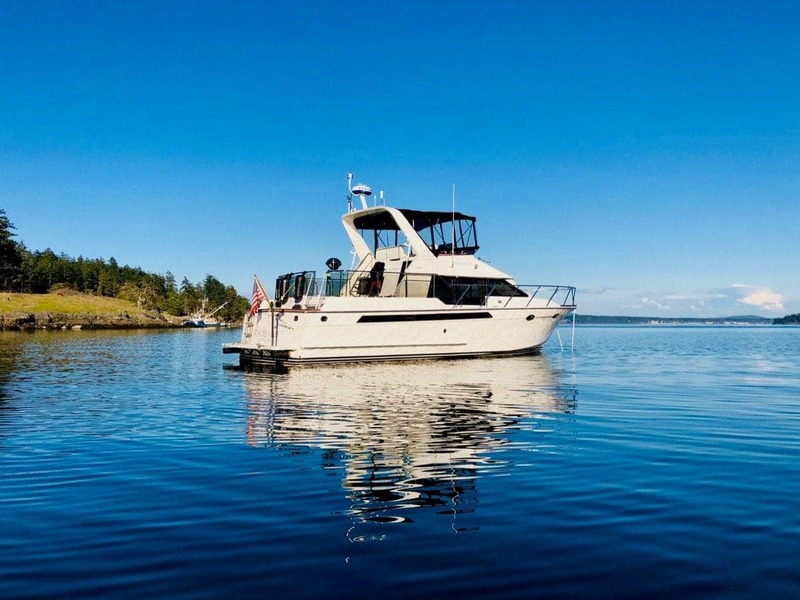 What I can say is that it appears the boat burns about 5 gallons per hour at 9-9.5 knots with both engines running and the generator at moderate to full load. Bumping it up to 12 knots burns 9 gallons per hour, which is where the previous owner ran the boat a lot. I'm happy with both of those numbers, and for some of the bigger trips I have planned later this year, the 5 GPH / 9.5 knot number will work out with other boats I'm traveling with. I've also confirmed with two other owners of nearly identical boats that these numbers seem realistic. At 15-16 knots, some of the numbers ranged from 20-30 GPH which is...not optimal, and I am not 100% sure of the data. I am very sure that running at that speed is not economical, and never thought it would be, but it is interesting to try. The mountains continued to impress with their views and the clouds got in on the show as well. 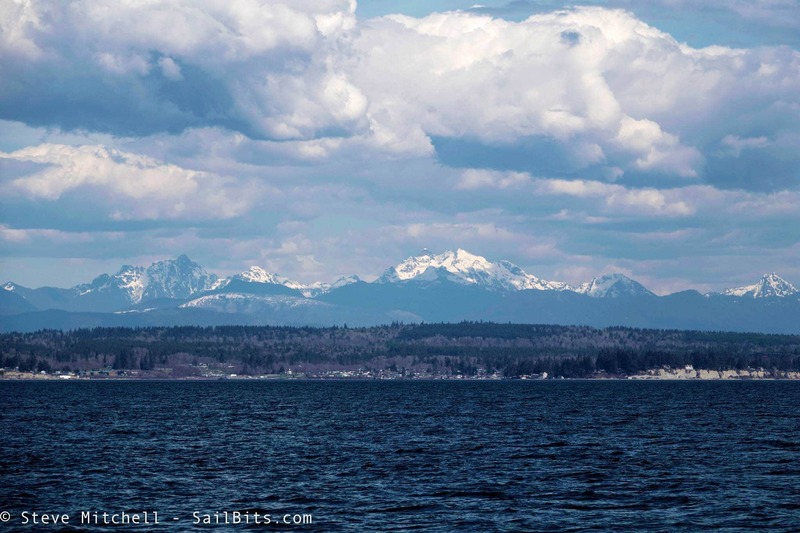 We entered Elliott Bay with steady winds out of the north at 20 knots, gusting higher. As a test, I drove through the marina fairway near our slip, and it was gusting to 20 knots even in there, which was unusual. Rather than try to dock the boat in that, I decided to go do a run along the Seattle waterfront. My company is moving to a new high-rise tower in a few months, and I was able to get a great photo of it while we were tooling around in the harbor. It is the new-looking glass-shard type building to the left of the Columbia Tower. After about an hour or so of motoring around, the wind was just not letting up. I was a bit nervous, but I am starting to learn more about Rendezvous windage, and applying my years of sailing experience. After motoring straight down the fairway past our slip, I did a pivot turn, let the wind blow me down the fairway in line with the slip and scooted right in. 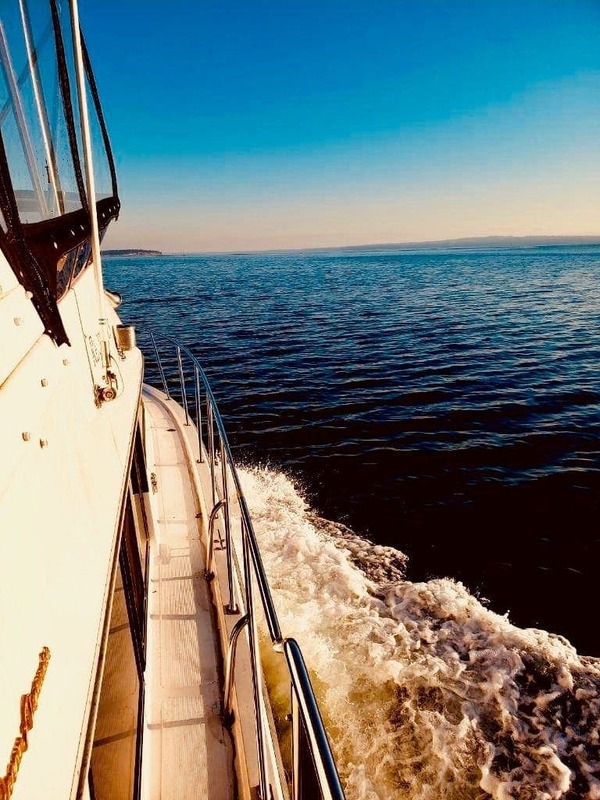 Elliott Bay Marina's fairways are notoriously narrow - I am 46' LOA and I believe the fairway is 50'. But I was very happy with our slick docking, and the new camera helped a ton to see the dock as I got in the slip. My neighbor even commented on how easy I made it look! Salon driving station - I drove from this station a bit more than I expected to. I am glad I invested in some instrument upgrades here, but I think I may put a single bigger display here - either another TZT2 MFD or a touch screen connected to the Surface Book. I'm also considering removing all of the analog gauges and mounting my instruments in the leftover cavity - there is a ton of space there, although not terribly deep. I think I will sit on this decision for a year and see how the Actisense EMU-1 data works out. Fuel burn - I tried to use my new ultrasonic diesel tank monitor to calculate some measure of fuel burn during the trip, but it wasn't very exact. I would like some way of knowing real-time information, but also understanding the best places to run the boat for fuel economy vs. speed. 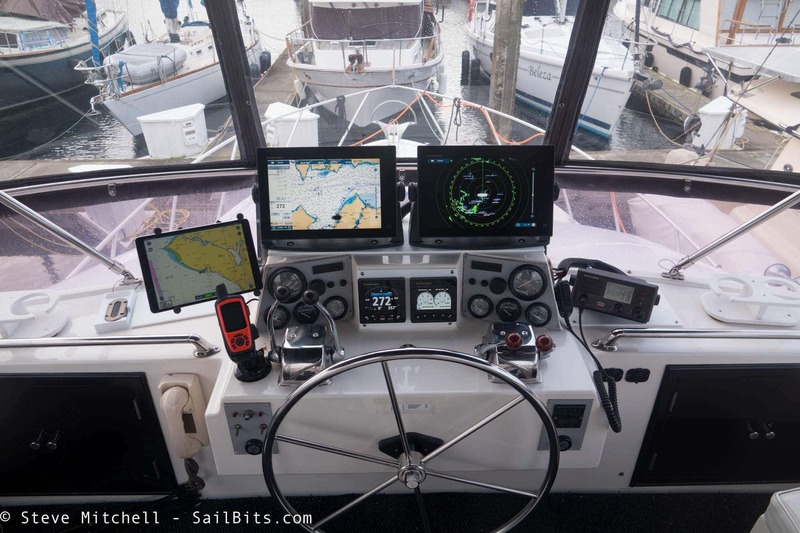 I have looked into installing a Maretron system, which I had on a previous boat, and may do that later this year. Overall, this trip was a resounding success. Everything worked extremely well, it was very relaxing and enjoyable journey, and we got to explore each location we stopped at. It was done with wonderful company - both my crew and friends on Sea Bear, and we all arrived safe and rested at our destinations. I can't wait to take longer trips on Rendezvous this season, and start to deploy even more parts of the system including above and below water drones, and many more toys!